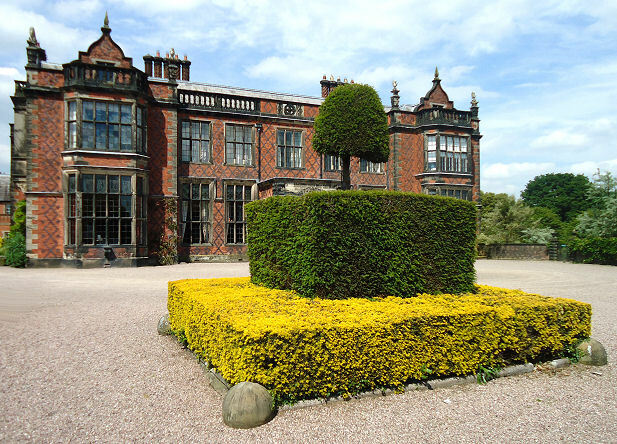 Arley Hall and Gardens are only about six miles from the M6 but are approached via country roads with chocolate box scenes of english villages along the way and you are instantly transported from a frenetic Twentieth First Century into a timeless calm. The entrance to the gardens is quite a walk from the car park so put on your sensible shoes, but as garden visitors I suspect you probably know this already. On the way you will walk past a very good nursery (which in my opinion is best left till after the visit) which sells plants you will see in the gardens. 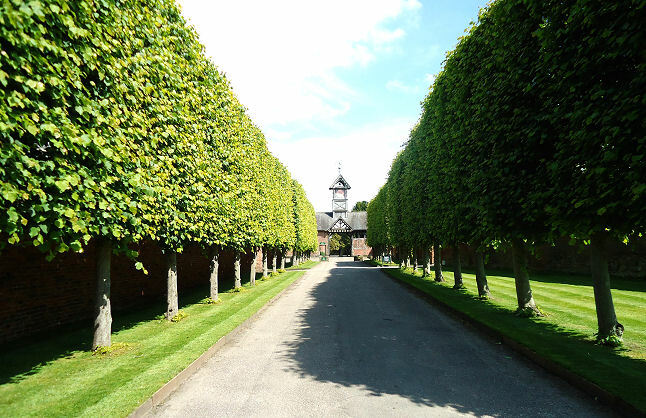 You then turn a corner and see the avenue of pleached lime trees which is about as stately a progression towards an entrance as you can get. The hall itself is only open one day during the week so check beforehand if you want to go in but the gardens themselves are open every day. The present Hall was built in 1832 in mock Jacobethan style for Rowland Egerton-Warburton the great great grandson of the present owner Viscount Ashbrook although there has been a house on the same spot since 1469. In the stable blocks where you buy your ticket you will find all the facilities you need from toilets to a cafe/restaurant and a shop. Arley is a large estate as most of these stately homes are and it has parkland and formal gardens. You can either wander around the woodland gardens and Grove by going round the end of the entrance block or visit the formal gardens first by taking the entrance through the archway under the clock tower. The observant will notice the clock only has an hour hand. Why would you care about the minutes when you live in such an idyllic location? 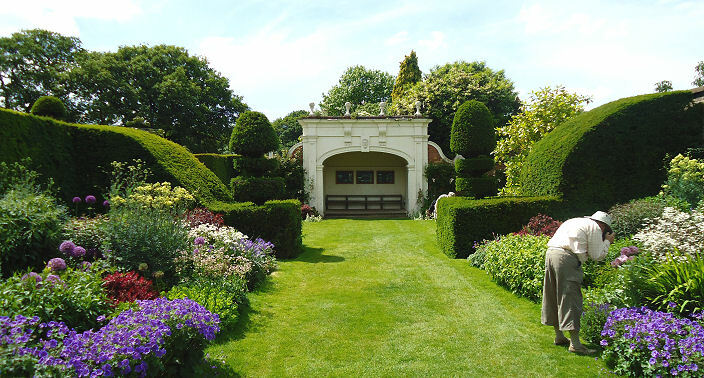 On your right a little way after the archway you will see a small shed and a sign saying “Entrance to the Garden”. This, of course, is the entrance to the garden but if you are visiting the Hall first go straight on and you will find another entrance to the garden by the front drive. 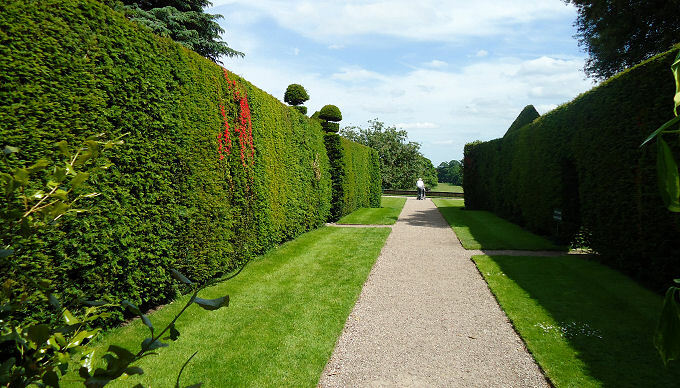 Once through the entrance you will see magnificent yew hedges and a series of smallgarden rooms such as the Flag Garden and the Herb Garden. The Flag Garden is named after the flagstones that it has for its paths so don’t expect the flags of other nations to be flying. The paths in the other parts of the garden are either gravel or grass. Each of these gardens has places to dwell and seating to sit and by the looks of it people relatively local come just to relax on one of its many seats and soak up the view and the smells. I, of course, like to keep moving and wonder what is around the next corner. 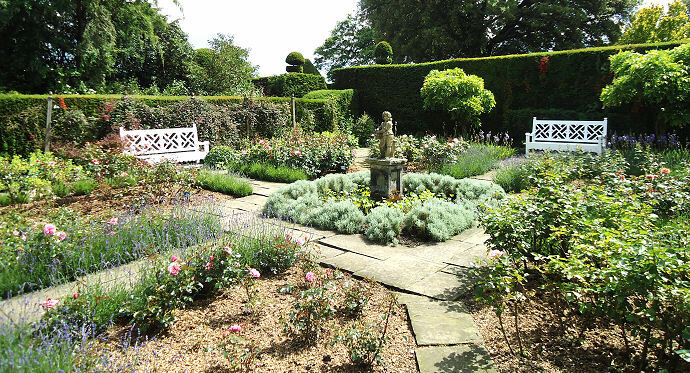 The good thing about Arley is that doubtless everyone who visits will have their own favourite part. Throughout the gardens you will not only find wonderful yew hedges and specimens and clipped box but other plants forming “boundaries” such as santolina and alchemilla mollis so each area develops its own character. Are they Chess pieces or Tweedledee and Tweedledum? 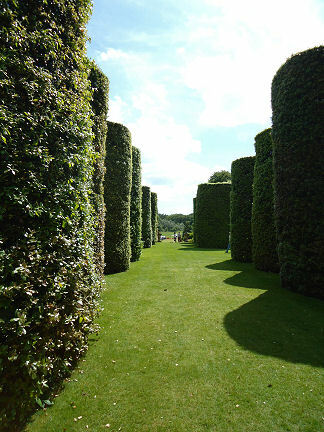 Many of the high yew hedges have cake stands on the top which give a sense of definition of place and scale. They also make you wonder how the gardeners get up there to cut them with such precision. Between gardens at Arley there are fine yew walks which enhance the spirit of expectation as to what you may find in the other garden rooms. You will know go past the Kitchen Arbour which seems big enough to feed a family of one hundred until you reach the extensive Walled Garden. This is probably the biggest walled garden I have ever been in and the pool at the centre has a wonderful sculpted metal Lilly which sets off the views perfectly looking in all directions. Most keen gardeners would give their right arm to have this as their own such is its size although, thinking about it, most keen gardeners want to use their right arms in their work of pruning and digging so perhaps not. 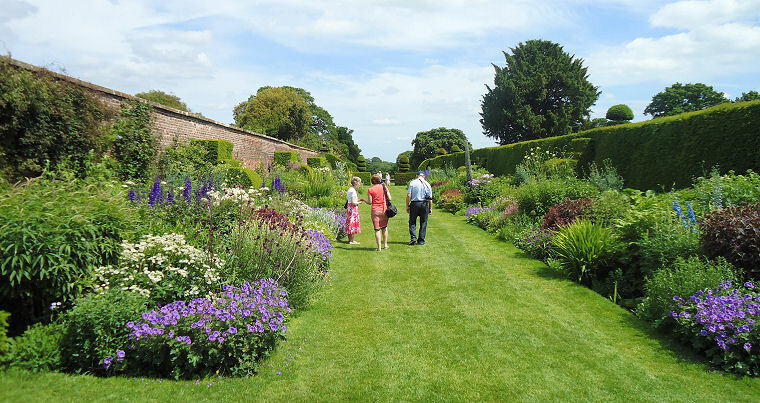 You will now have done a left turn somewhere along your way and you next enter what is the most iconic section of Arley Hall Gardens and perhaps its most photographed, the Herbaceous border. The very helpful lady in the ticket shop gave mea map and you can see that the border runs almost parallel to the front of the house but actually who cares. The topiarist will run up and down this vast line in glee. Every plant you would expect to see in an English garden and some you wouldn’t will be found in the borders but they are made more exciting by the flying buttresses of yew hedging which divide them up into sections. On one side you have the wall of the walled garden and on the other a yew hedge with finials on top and if a gardener were locked up for twenty years in a garden prison this is where I suspect they would like to be. (I am not sure it is Government Policy quite yet to lock people up in garden prisons in case you were wondering). If you wander down towards the pavilion (I think its called the Alcove) to look at the information boards or simply seek some shade on the one sunny day a year then suddenly you will come across a full size tennis court to your left with a thoughtfully constructed green surface. They had planted a few more yew trees at its entrance when I visited which when grown will obscure it mainly from view but I rather liked the formal avenue leading to a tennis court and this makes it the most sophisticated sports arena I have ever seen. entrance fee on their own but to get both makes you very luck indeed. Still that’s not it as there’s another enclosed garden to see. The Fish Garden is perfectly formed in size with lovely dumpy topiary mounds around the pool and small terraces to give interest and yes another tempting seat to sit awhile and ponder on tranquility. 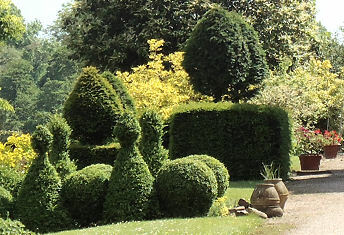 Throughout the gardens there are specimens being grown and I particularly like the clump of box trees behind the Hall which look like a ball and skittles which are offset majestically by the larger yew specimens behind. All in all Arley Hall has lots to keep the interest going, the spirit of adventure alive and the inspiration to copy a few of its details in your own eternal plot. Its also accessible by wheelchair and I did see one gentleman on a mobility scooter so I expect to go there again when I am ninety and whoosh my way around its hidey holes.